Italy's credit worthiness has been downgraded by the ratings agency S&P. It said the continued weakness of the Italian economy was behind the cut, which saw the rating of government debt lowered to BBB from BBB+. Italy, the eurozone's third largest economy, has been in recession since the middle of 2011 and unemployment is currently running at more than 12%. S&P said it expects the Italian economy to contract by 1.9% this year, much worse than its previous forecast. 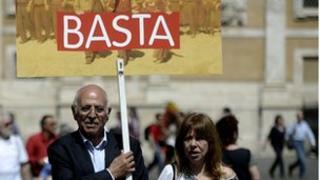 The agency said that a lack of reform is partly to blame for Italy's poor performance. "In our view, the low growth stems in large part from rigidities in Italy's labour and product markets," S&P said in a statement. It supported that view with European Union data that showed Italy's labour costs have risen more than any other eurozone nation. Commenting on the downgrade on Italian television, Prime Minister, Enrico Letta said: "It's proof that the situation is still complex and Italy remains under special observation."